Monetize YouTube even under 10,000 views if this is the case - IT ADDA! * This article was written with proof and it was original but it was happening due to technical issues of YouTube which was fixed on 20th Sept 2017. So this article is no longer valid. Thanks for visiting this page. You can still read our other articles related to YouTube here. If you’re also a regular YouTuber then I’m sure you have also heard that from 6th, Apr 2017 you must have at least 10,000 total lifetime views in your videos to monetize or earn from YouTube channel. Yes, it’s somewhat true as their newest YouTube Partner Program Policy says the same thing. That’s not completely true, It is possible to monetize your YouTube Channel using Adsense even when you don’t have 10,000 views on your channel. This is not a trick or anything illegal. This is just an optional way if you already have an Adsense account. 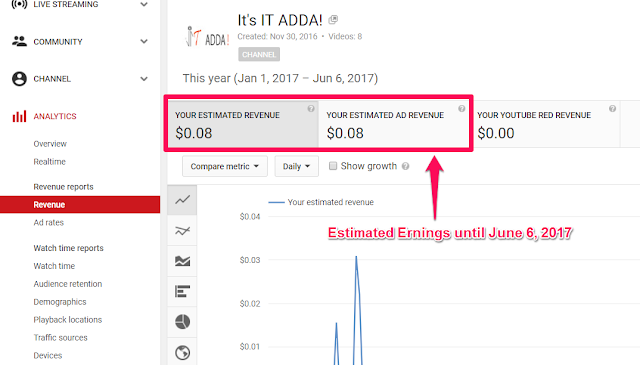 In this post, I’m going to show you How you can monetize or earn from YouTube using Adsense, without having 10,000 views? Everyone knows about the new policy so I would not talk about that, I will just show you how I still use my existing Adsense account to monetize my YouTube Channel. As you can see in the screenshot above, The channel has only 407 Total Lifetime Views when I took the screenshot. Also read: How To Get More YouTube Views/Traffic From Facebook? It’s the official channel of this blog, You can check the current statistics of the channel with this link. And if you’ll look at the right bottom of the screenshot, then you’ll see that the channel has received a monetized playback in the last 28 days. And that monetized playback was worth only $0.0010, so it’s not being shown in the estimated revenue. If you’re thinking how do I know it worthed $0.0010 then just look at the screenshot again with zoom in. The graph shows it clearly. I know it’s a very small estimated earning but the fact is it’s true and the screenshot proves it. Now let’s check out why I am still able to monetize YouTube without having 10,000 total lifetime channel views. 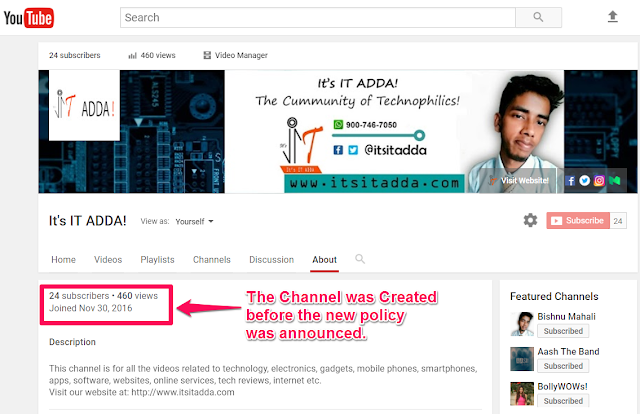 As shown in the screenshot above, the channel was created on November 30, 2016. That is before the announcement of the new YouTube Partner Program Policy. This can be one of the reason but I have talked with a few others with the same conditions but they are not able to do it. So I’m not sure about this. Still not being sure but this one may also be the reason that I’m able to monetize my channel without having 10,000-lifetime views. The AdSense account that I use to monetize my YouTube Channel, is actually an Adsense for the content account. Usually, YouTubers use Hosted Adsense account to monetize their YouTube Channel. I already had this Adsense account since 2014 and I earn good enough with Google Ads on my blogs and websites. Maybe they’ve determined me as a genuine publisher since I’m using their service for a long time and I’m doing it really well. Maybe that represents me as a good publisher on YouTube too and that allows me to display ads on my YouTube Channel. I think this one is the main reason, however, I’m not sure about it yet. You may also Like to read: How to Create Multiple YouTube Channels using Single Google Account? In my opinion, it is possible to monetize your YouTube Channel even when you are under 10,000 total lifetime views on your channel. You just have to match any of the situation above or a combination of them. However, It’s not yet proven by others than me. At last, I would really like to know your opinion about it and if there is anything else to share with us. Just use the comment box below. Do share it with those who may find it useful. And finally, Thanks for being with us. Next story Chrome to Filter Ads by Default – Publishers Revenue at Risk! You can do that in so many ways. You can also use Google AdWords to advertise and grow your YouTube channel.